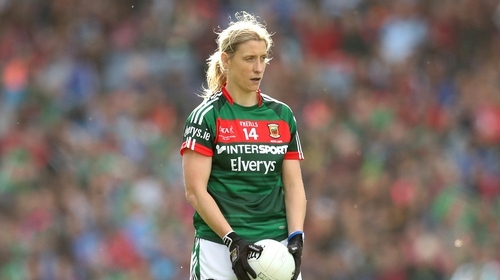 Four-time All-Ireland winner Cora Staunton says her "Mayo days are done". The Carnacon star has strongly indicated she will not be returning to the inter-county team after leaving the Mayo panel last year. Staunton was one of 12 players to depart the squad. The group who left cited "player welfare issues" as their reason for stepping away from the team. Mayo manager Peter Leahy said at the beginning of this year that he would be planning for the season ahead without those 12 players and called for his team to be given time to develop. Staunton, who is currently in her second season with AFLW side Greater Western Sydney Giants, previously said on the Late Late Show that she couldn't see herself playing for Mayo again, and has now reiterated that stance. "I'd be the type of person who says never say never but my Mayo days are done certainly," she told Jerome Quinn. "I've had 24 seasons playing with them, it's quite a long time. I've been lucky enough that I've played for that length of time and practically injury-free. "I played every championship season and that's what's been huge. My focus will be on Carnacon when I go back. Last year was a rough year for us. In saying that, I think we won our 20th county title which is massive. We were pipped in the Connacht final by Kilkerrin/Clonberne, who are a smashing team." Staunton would be finishing with Mayo as one of the most decorated players in the history of Ladies football after making her debut in 1995. She played a key role in helping the county to four All-Ireland crowns throughout the 90's and early 2000's. The legendary forward says she will take a break before resuming her club duties with Carnacon for the rest of the season. "It'll be back to club when I get home. When the season finishes here, I'll take a little bit of time to rest the body. "It's been a long two or three years so I haven't had a break. All my focus will be on Carnacon and hopefully win a 21st county title, try and get back to win another Connacht and who knows after that. "I'll certainly keep playing club as long as the body allows me to."